It’s these sort of questions that I’m particularly keen to answer about technology. There are lots of (great!) sites that cover the day-to-day. And there are some fantastic writers who divine what it all means. But I think there might be a niche for context. What is the historical angle on today’s news? What is happening on the business side? Where is value being created? Since then I have written 308 Weekly Articles and 659 Daily Updates (and recorded 159 podcasts) answering exactly those questions, and, thankfully, have managed to create some value of my own: in 2014 I launched the Daily Update and have been supported by subscriptions ever since. 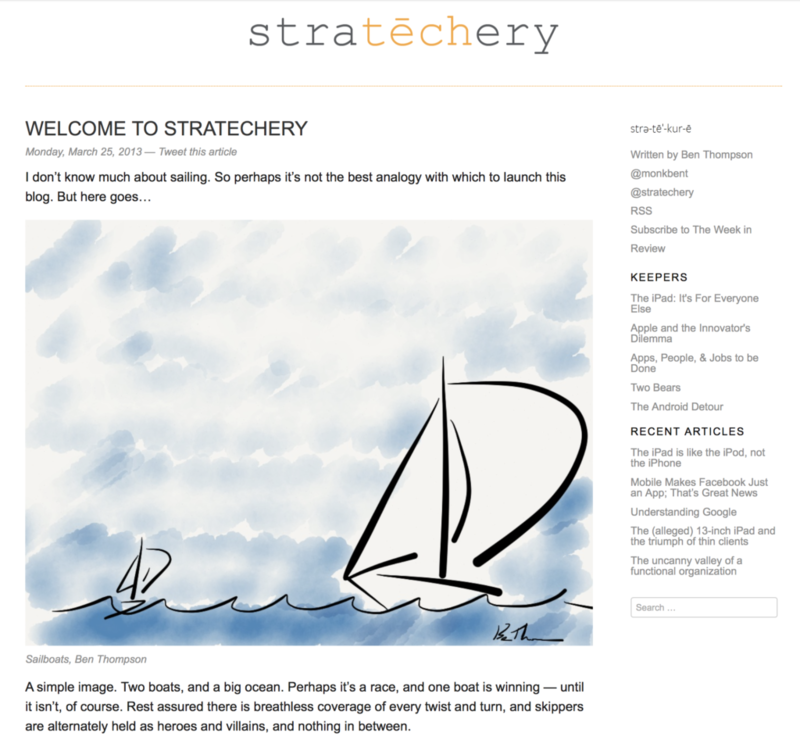 For a long time, though, I have wished Stratechery did a better job of providing value not just through daily emails and posts, but to the new user stumbling across the site for the first time, or the long-time reader hoping to find that one post they remember reading. This update is all about those two use cases — and yes, a new logo and visual refresh. Topics: The Topics page is just like the Companies page, but about, well, topics! Things like earnings, or cryptocurrencies, or Taylor Swift (and Kanye West!). 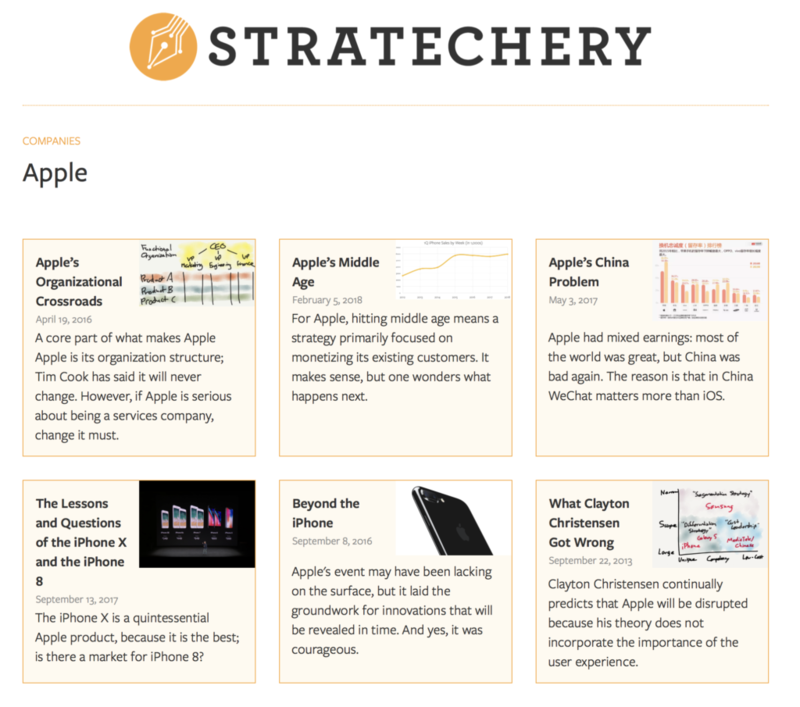 Right now there are 121 topics in Stratechery’s taxonomy. Instant Search: Once on the search page you can get results instantly, helping you quickly iterate on your search terms without waiting for a refresh, all with typo-tolerance and synonym search. This should make it far easier to find that post you remember reading way back when. Designed by Brad Ellis of Tall West, the new mark represents Stratechery’s emphasis on writing, the focus on technology, and, of course, my drawings.3 The Archer type-face is a call-back to Stratechery’s original Courier, and the feeling of a type-writer. I’m extremely excited, and hope you are as well. In addition, there are now related articles under posts, the all-caps headlines are gone, and the sidebar (drop-down menu on mobile) has been reconfigured. Frankly, I remain very happy with the rest of the site: that is how good of a job Philip Arthur Moore did when he re-built my original version from scratch in 2015; he did an equally fantastic job on 4.0. For the first few years of the Daily Update I used a modified MailChimp template; it was functional, and most importantly, it was very easy to prepare and send emails. Unfortunately, those templates didn’t work so well in Gmail on mobile; that’s why I launched a new template last summer. It rendered correctly everywhere, but preparing each email was a laborious process that took as long as 30 minutes a day. Worse, it introduced multiple opportunities to make mistakes. I am honestly staggered at how much better it is going to make my day-to-day life. What was most impressive of all, though, was the way CEO Jacqueline Boltik took the way to deeply understand my workflow and needs, and only then came up with a solution. I can’t wait to see what she and Yellow Brim build next. Normally I would close this post by thanking all of you, my readers, for making this possible. That is absolutely true, and I am more grateful for your support than you can know. On this occasion, though, I need to save my final and most fervent thanks for Daman Rangoola (warning: excessive amounts of Lakers talk behind that link). Stratechery 4.0 has been months in the making, and Daman has shouldered the biggest load by far, particularly the rich taxonomy applied to those 1,128 pieces of content. As you can tell by looking at the new features above, it is plain fact that without Daman, Stratechery 4.0 would not exist. For now, though, I hope you enjoy the new site: explore the Concepts, Companies, Topics, and play with Search, and do let me know (via Member forum or email, not Twitter) if you find any bugs. We’ll be fixing things up for the next little bit I’m sure.